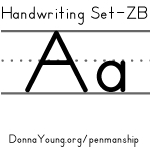 2-Stroke A, 3-Stroke A: Capital a can be written with 1 pencil lift or 2. I am providing both because I don't know which one you will prefer. The animations are un-intimidating and hand-drawn. The lower case "a" has absolutely no pencil lift. If you require a pencil lift, see the link below. Both 2-stroke and 3-stroke are also animated. Click on these links to access the animations for the letter "A"
This item, the Homeschool XLS Term Dates Calculator, is an xls file that requires a spreadsheet program. With this file, go through 5 steps and on the 6th step, the calculator will return school term dates.